Tara Sharp should be just another unemployable, twenty-something, ex-private schoolgirl ... but she has the gift—or curse as she sees it—of reading people's auras. The trouble is, auras sometimes tell you things about people they don't want you to know. When a family friend recommends Mr Hara's Paralanguage School, Tara decides to give it a whirl - and graduates with flying colours. So when Mr Hara picks up passes on a job for a hot-shot lawyer she jumps at the chance despite some of his less-than-salubrious clients. Tara should know better than to get involved when she learns the job involves mob boss Johnny Vogue. But she's broke and the magic words 'retainer' and 'bonus' have been mentioned. Soon Tara finds herself sucked into an underworld 'situation' that has her running for her life. 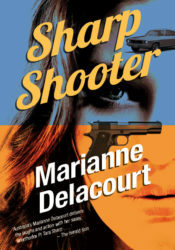 Marianne Delacourt is the pseudonym of a successful, award winning Australian sci-fi fantasy author who is sold throughout the world. Sharp Shooter is set in Perth, where the author grew up. The next book in the Tara Sharp series is Sharp Turn. Marianne now lives in Brisbane with her husband and two galahs. “Tara Sharp is a gust of fresh air in the local crime fiction scene. While it is wonderful that our more literary crime writers are finally getting the attention they deserve, there’s still plenty of room for fast-paced commercial female-oriented Australian crime fiction. 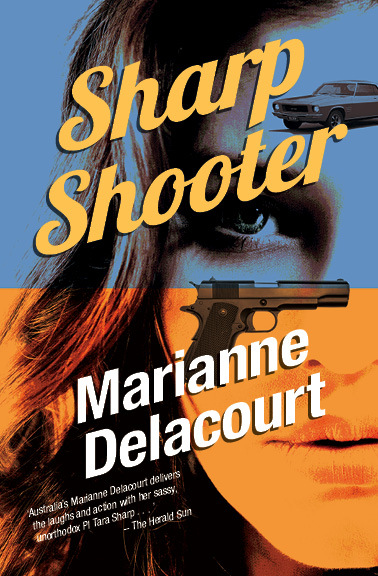 And Marianne Delacourt (aka sci-fi writer Marianne de Pierres) has certainly nailed that brief.—The Australian Bookseller and Publisher. I stared across the desk at the psychiatrist and tried not to fiddle. Betsy Waller was a school friend of my mother’s, whom I’d known since I was a kid. A no-nonsense type of shrink. Her office was polished floorboards and cherry veneer clean, her leather chair bigger than my bed. Certificates smothered the walls. She’d been asking me questions for nearly an hour, and by the way her forehead was now wrinkling, I could see she’d reached her verdict. Tara is nuts. Or, maybe, Tara is NUTS. Betsy flushed and dropped the pen onto her blotter. Bets pursed her lips at that and did an admirable job of NOT looking at her hands to see if they were glowing orange. ‘Don’t mention this to anyone. Understand?’ she said, a whiff of anxiety evident beneath her professional mask. Her deep orange aura flickered too. I left Bets’ office and drove Mona, my beloved Holden Monaro, home along Stirling Highway, past the designer furniture shops and real estate offices. Since I’d been sacked from my last job, I’d had to move into my parents’ converted garage until I could afford to rent again. Unemployed and living back at home. Looooser! I parked the car on the curb outside number 25 Lilac Street and walked down the side of the house to my flat, thinking about my empty bank balance and my lack of job prospects. Staving off the beginnings of a good bawl, I made myself a black tea. My flat comprised an all-in-one kitchenette, sitting room and bedroom. Toilet and shower were outside, across a bricked patio. Not ideal, but better than returning to my childhood bedroom and having to observe my mother’s insane rules on … everything. After I’d finished the tea, I took a deep breath and rang the number Bets had given me. ‘You come over tonight, Ms Sharp,’ said Mr Hara, after I’d explained who I was and how Bets had recommended I contact him. ‘You got touchy neighbours?’ I asked. ‘Why am I coming to see you, exactly?’ I know that sounded silly but I wasn’t really sure why Bets had referred me to him.